Camp Hammer is located on a scenic hillside overlooking Lake Coeur’ d Alene, part of the Idaho Panhandle. The site is home to a surrounding forest with a perched view of the vast lake beyond, before dropping off 125 feet towards the edge of the lake. The lot is long and narrow, with more than half of it unsuitable for building. These restrictions, in conjunction with the owner’s desire of a minimal footprint, required a design that would maximize efficiency of the site and the interior spaces. The aesthetic approach was dubbed ‘Cabin Funk’. To the owner, it meant a mood that felt eccentric and lived in, yet modern and refreshing. This was translated architecturally into a language that reflects the harsh environmental conditions of the region and the topography of the site. Cabin Funk evolved into a simple box that resembles a subtle bunker, nestled into the hillside. Certain structural details and connections are exaggerated to express the feeling of being snug into the landscape within the site. 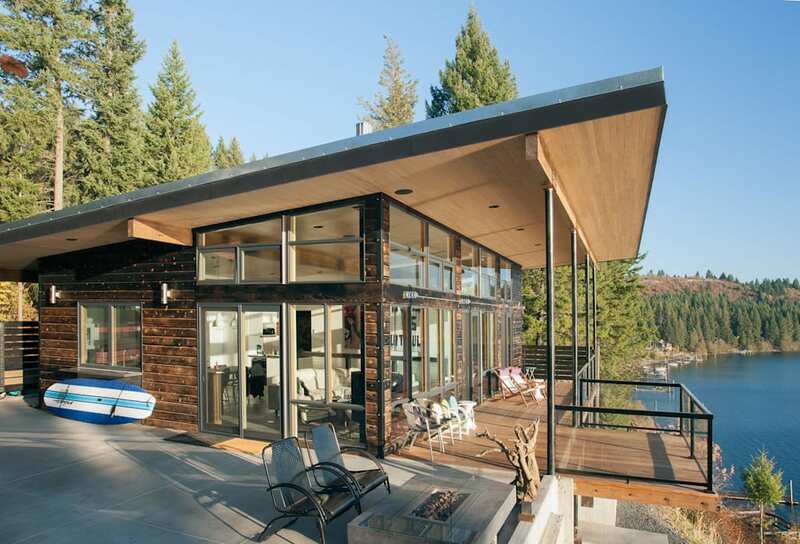 Their presence added to the overall mood of Cabin Funk, while expressing the restrictions of the site and the natural surroundings. Certain instances, such as a cantilevered roost (for morning coffee) over the steep cliffside, reflect unique structural accomplishments that create delicate moments.